This has been the warmest La Nina ever, and I have to wonder if this hasn’t been the warmest January in Chicago. Of course it’s early yet. Last year on January 13 we had snow and the lake had a think layer of ice on it. But the prediction this coming Friday is for above-normal temperatures to continue. The lakefront sunrise Wednesday morning was earlier, the days are getting ever so slightly longer. The crows, of course, were in attendance. has been sipping sap from the trees the Sapsuckers have drilled into. The Sapsuckers themselves are late to leave. There was also a Cooper’s Hawk at Millennium Park that morning, and I annoyed him enough by taking his picture. He eventually moved on, leaving the warbler safe. I woke up this morning with the prelude to the Bach A minor English Suite playing in my head. Only the purest silence eventually makes me aware. There was a little frost last night, but by the time I left the house it had melted off. I went to the Chicago Portage to see what exists. The tangled web of bare trees and dried vegetation offered winter views. All quiet, asleep, but potential lurks in that dormancy. I did not get pictures of all 11 species that I saw. 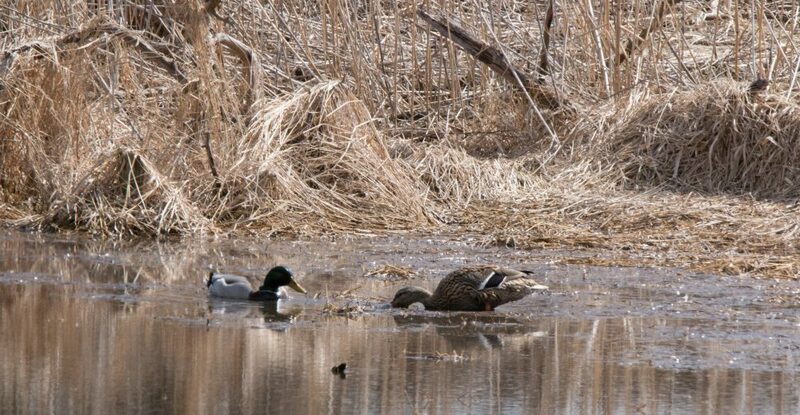 The first bird was a flyover Mallard duck. A little later I heard a constant sound that resembled a murmuring quack, or perhaps it was a squirrel sound. It turned out to be a Downy Woodpecker pecking away at the dried stems of Phragmites that grow by the water. I can’t imagine if the stems harbor dead bugs or some other delicacy but the Downy was persistent, until he flew up into the tree and gave me this nice photograph, one of several. There were Mourning Doves sitting quietly in a tree. Music in my head at the Portage was Albeniz, since I recently decided to revive the few pieces I once knew. The birds complied and remained in C#. On the path ahead there were several cardinals and goldfinches foraging. It has been so warm, lichens are growing on this dead log. I left the Portage and went to the grocery store, where by this time my head was playing the Tango by Albeniz which is in D major. I only remember this because the woman in line behind me thanked me for giving her my “tickets” – there’s some kind of promotion going on that I don’t have time for – and our conversation was in D. What would she think if I told her I had made her talk to me in the key of the music playing in my head? Was it worth the tickets I gave her? I saw a Junco at the Portage but didn’t get a picture of one until I got home. This one is through the porch window. Later this evening I counted 23 Mourning Doves under my feeder. It was too dark to take a picture, but I counted them three times to be sure. I had thought they were in decline because I wasn’t seeing them. I have never seen that many in my yard, ever! The new feeder must be doing a good job. This entry was posted in Bach, birds, birds in key, Crows, Mourning Doves, photography, Warblers and tagged Albeniz, Black-Throated Blue Warbler, Chicago lakefront, Cooper's Hawk, Yellow-Bellied Sapsucker by Lisa Rest. Bookmark the permalink.